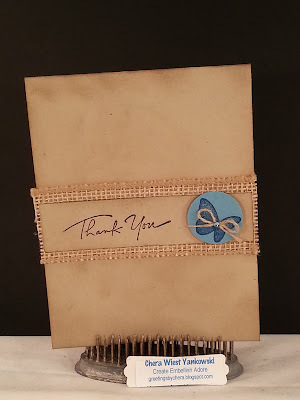 The thank you cards my son wanted/needed were to be 10 minutes cards... at his request.. nothing frilly but fun... I hope I delivered what he wanted, since I had to make 10 of them. Its been a while since I have been in the craft cave.. felt good- which is handy since I have to get started on holiday cards! Crumb cake cardstock with burlap and a butterfly punched out with a circle punch - adding the twine and the rhinestone was afterthought, but I like it! great masculine cards, gotta love them being under 10 minutes!